Thames pageant in three minutes Jump to media player The BBC used a time lapse camera to film the Diamond Jubilee Thames River Pageant, so you can watch every one of the 1,000 ships that took part, sail past in under three minutes. Crowds brave rain for Jubilee pageant Jump to media player Hundreds of people queued in the rain to get into London's Battersea Park to watch the Diamond Jubilee Pageant - the biggest spectacle on the river Thames for more than 300 years. 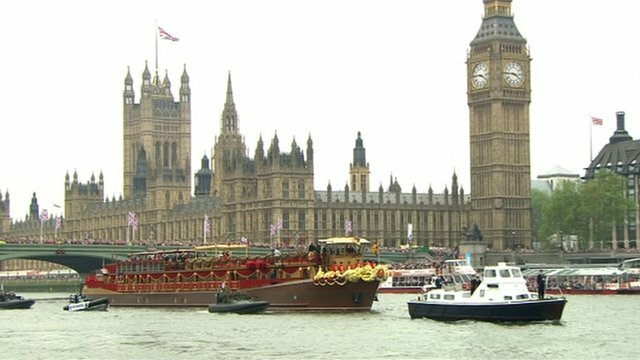 Key moments from river pageant Jump to media player Tens of thousands of rain-soaked spectators pack London as the Queen's 1,000-boat Diamond Jubilee pageant weaves its way along the Thames. 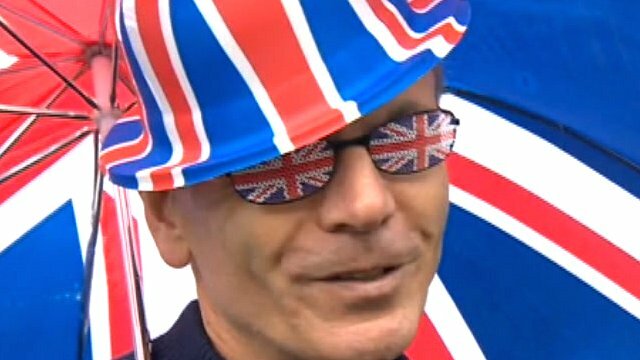 The BBC used a time lapse camera to film the Diamond Jubilee Thames River Pageant, so you can watch every one of the 1,000 ships that took part, sail past in under three minutes. More than one million rain-soaked people watched the event as the boats weaved their way along the Thames, organisers said. The Queen's barge travelled among the flotilla of tugs, steamers, pleasure cruisers, dragon boats and kayaks.